Tochigi (Japan) (AFP) - Playing to a captive audience is all in night's work for Japan's jailhouse rockers. Armed with acoustic instruments and prison-worthy lyrics -- "cheer up, don't give up" and "it's okay to make mistakes" -- the female duo Paix2 has been rocking cell blocks for 15 years, and show no signs of stopping. 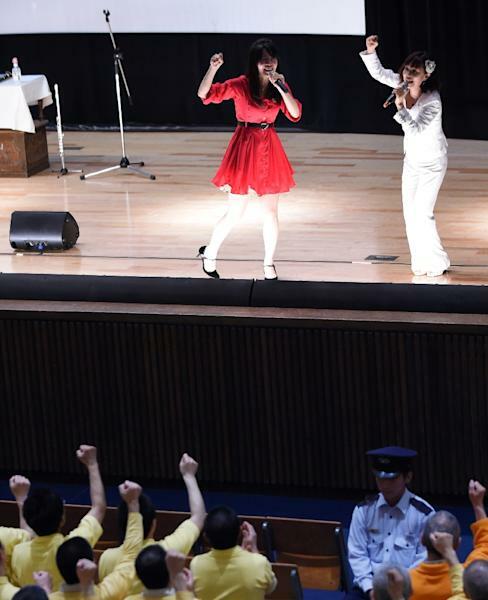 "The pair -- Manami Kitao, 37, and Megumi Ikatsu, 39 -- recently played at Kurobane Prison near Tokyo to an audience of convicts decked out in identical yellow prison uniforms and with close-cropped hair. Guards at the show dispensed with a few of Japan's notoriously strict prison rules by letting the 500 concert-goers sing along and pump their firsts -- for two numbers. "But the officers will take you out in the hall if you get too excited!" Kitao warned, sparking a roar of laughter from the crowd. The gig marked the duo's 362nd prison concert, and their unlikely niche could put them into the Guinness Book of World Records as the most toured prison band. 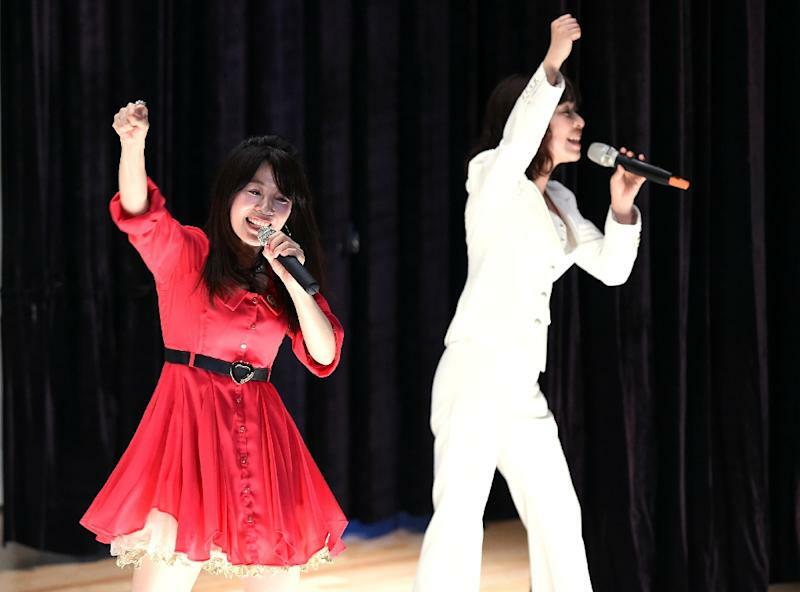 The two women were discovered by their current manager at a singing competition years ago in rural western Tottori prefecture where they grew up. While at a local event, a police officer suggested they perform to inmates and it wasn't long before singing to thieves, killers and drug offenders turned into a profession. But Ikatsu remembers the first time she stood in front of an audience filled with menacing male prisoners. Her hands shook as she held the microphone. "It was intimidating because they had this intense gaze and no one smiled," she said. Kitao has similarly grim memories: "I was terrified because there was no reaction. My mind went blank and I hardly remember anything about the first concert." Despite their jittery start, word quickly spread about this pair of young female singers who still have next to no competition in their field. The duo's folksy range of originals and covers, running to pop rock and interspersed with talking, had the seated Kurobane prisoners clapping along and cheering in restrained enjoyment for 90 minutes. "Their concert made me really think about the meaning of life," a prisoner in his 40s, who was jailed for drug use, told AFP after the show. "I thought I should do my best here until the day I leave," added the man who said one song brought him close to tears. Arrests in Japan have fallen over the last decade -- the country already has a very low crime rate and just 60,000 prisoners from a population of about 127 million, far lower than some other advanced nations. Japan had 51 prisoners per 100,000 people, while the figure was 710 in the US, 147 in the UK, and 98 in France, according to latest Organisation for Economic Co-operation and Development (OECD) statistics. But the rate of recidivism among people arrested has been on the rise, jumping to nearly 47 percent in 2013 from 28 percent in 1997. The government is hoping to tackle the problem by boosting employment programmes for ex-inmates, as Tokyo gets ready to host the 2020 Summer Olympics. Toru Matsumura, in charge of the prison's education programme, says that holding live events for prisoners might help reverse the trend. It's a way to "give prisoners a chance to change themselves for the better", he adds. The singing duo also hope prison shows have an impact -- and maybe soften the public's image of hardened criminals and the jails they call home through the media's interest in them. "I think the public's understanding of prisoners will change if they learn about life there," Kitao said. But they're not getting rich doing it. The mostly weekend prison gigs rake in about 30,000 yen ($250) to 40,000 yen per show, and that modest fee must also cover their accommodation and transportation costs to prisons across the country. "Performing at prisons meant that we wouldn't be like other famous singers on television -- the concerts are nothing glamorous," Ikatsu said. But the duo, who have played at every prison hall in the country, knew they made the right decision when former inmates started showing up at their less frequent shows on the outside. "Former prisoners who come to see our shows tell us they will never commit crime again -- that is the most meaningful moment for us," Kitao said.